Step One: Cut out pictures of things you love and/or want. Step Two: Pin clips on a cork board. Step Three: Realize your life's ambition and have your dreams become a reality? Well...sort of. Sometimes, life can be overwhelming. Everyone can benefit from a constant reminder of what they are working towards. 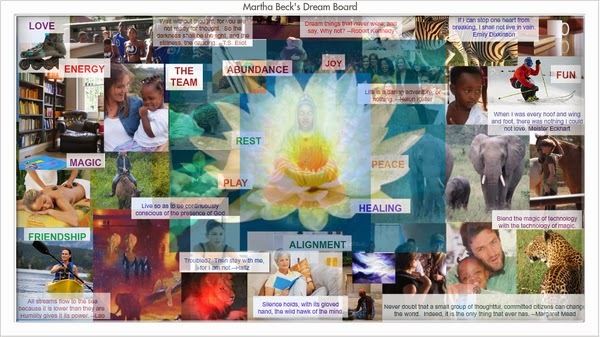 A vision board is a tool used to help clarify, concentrate and maintain focus on a specific life goal or goals. Vision boards can provide clarity, reinforce your daily affirmations and help keep you focus and attention on your intentions. For these reasons, it is best to keep your vision board out in the open, somewhere that you will see it daily. So start thinking about what it is you want in life. What will bring you happiness? Start scouring some old magazines or even finding pictures online of whatever you think will bring you happiness. I encourage you to truly put some thought into this though. Everyone can same the same things will bring them happiness. Money, health, a new car, a vacation...snore. Anyone and everyone wants all of those things. "When you start assembling pictures that appeal to this deep self, you unleash one of the most powerful forces on our planet: human imagination. Virtually everything humans use, do, or make exists because someone thought it up. Sparking your incredibly powerful creative faculty is the reason you make a vision board. The board itself doesn't impact reality; what changes your life is the process of creating the images—combinations of objects and events that will stick in your subconscious mind and steer your choices toward making the vision real." For more inspiration, Pinterest has a ton of ideas and examples! Have you ever created a vision board? Share your thoughts on vision boarding below, and link back to your own posts on vision boards.